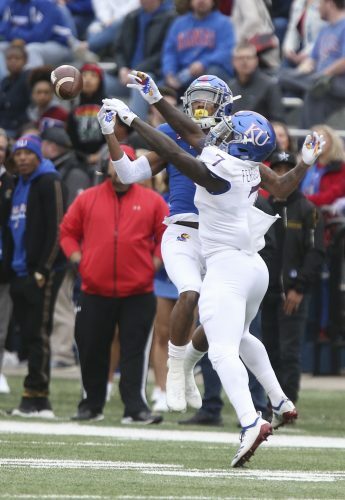 Kansas wide receiver Stephon Robinson (5) drops what would have been a touchdown pass during the first quarter, Saturday, Nov. 3, 2018 at Memorial Stadium. 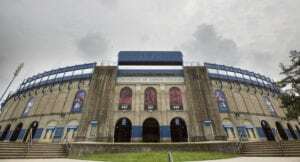 A foray into a reality where the Kansas football team protects its home turf and wins Big 12 games proved unsustainable Saturday at David Booth Kansas Memorial Stadium. A week after the Jayhawks upset TCU for their first conference win in close to two years, the Jayhawks didn’t come close to matching that level of success in a touchdownless 27-3 loss to Iowa State. The visitors led by 20 with less than three minutes left in the second quarter, and it was clear to embattled KU head coach David Beaty afterward that his team “missed opportunities,” while the Cyclones benefited from “not shooting themselves in the foot,” in front of an announced crowd of 15,543. “We made enough mistakes for them to be able to walk away with a victory,” Beaty said, after Kansas (3-5 overall, 1-5 Big 12) failed to deliver the program’s first back-to-back league wins since 2008. The Cyclones gave the thousands of ISU fans who made the trek to Lawrence something to cheer about early — as soon as their second possession. After KU sophomore Kyle Thompson boomed a 60-yard punt that died at ISU’s 5-yard line, the Cyclones laughed at the notion of poor field position. ISU picked up a first down and some breathing room on its first two snaps of the series. 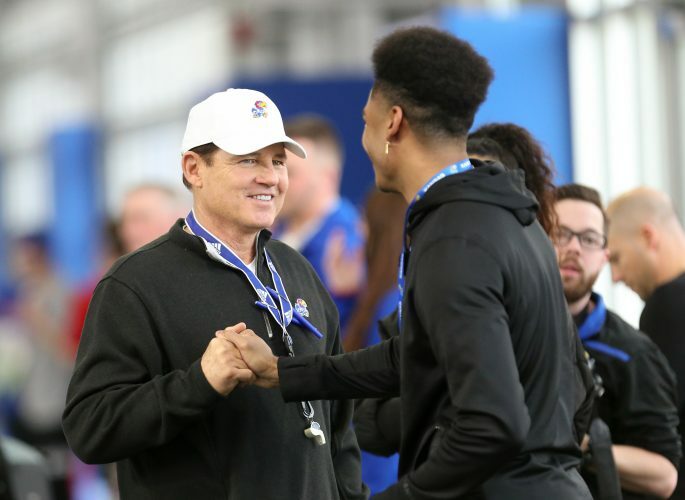 Then true freshman quarterback Brock Purdy placed a pass through a window of KU safeties Hasan Defense and Mike Lee for junior receiver Hakeem Butler, who proceeded to sprint away from Lee for an 83-yard touchdown. After the KU offense — only outgained 394-332 in yardage in the loss — countered with its second straight three-and-out to open the game, Iowa State’s next drive took even fewer plays. As if David Montgomery’s 14-yard rush to start the drive wasn’t enough, the Cyclones went back to Butler for an even more devastating blow on their second snap. After his route burnt Defense deep down the right sideline, Butler skied over a recovering Defense to snag an underthrown ball from Purdy (16-of-23 passing, 263 yards, three touchdowns). But Butler wasn’t done with his quick Randy Moss impression there. ISU’s long receiver went on to discard Defense, slinging him out of the way with his right hand, before running 10 yards to complete a 51-yard TD and give the Cyclones a 14-0 head start. “It was a horrible throw, great catch,” Defense said of the connection. “You know, he went up and got it. I wasn’t really in position to look back for it. So I couldn’t really make a play on the ball,” he added, explaining that he attempted to make a play on Butler’s hands in order to get the ball out at that point. A 5-11 junior safety, Defense said he felt responsible for KU’s two-TD deficit. In spite of its putrid first two possessions, the KU offense actually had chances to cut the visitors’ lead in half. A 19-yard Khalil Herbert rush gave KU a first down for the first time, more than eight minutes into the defeat. Three plays later, the Jayhawks were at ISU’s 40-yard line, and as a Peyton Bender pass floated toward toward the north end zone, a touchdown seemed a certainty. Bender’s fake handoff did its job, getting at least one member of ISU’s secondary to bite. As a result, sophomore receiver Stephon Robinson (four catches, 52 yards) ran free down the right sideline, without a defender in sight. Bender hit Robinson’s hands with his throw. However, the receiver couldn’t complete the routine play, dropping a surefire 40-yard touchdown. Just one thing, Robinson said afterward, was going through his mind as he watched the ball in. “Touchdown. But it didn’t work out like that,” the disappointed receiver said. Upon dropping the routine catch, Robinson said he felt as if he had just lost a chance to make a game-changing play. KU recovered enough from the second-and-6 foible to pick up a first down. But the series closed with yet another would-be TD pass falling to the turf harmlessly. On 4th and 3 and ISU’s 27-yard line, Beaty elected to go for it. Bender (19-of-41 passing, 185 yards, no interceptions) put another pass on the money, this one to receiver Jeremiah Booker. But the 6-2 senior couldn’t gather the ball with Datrone Young covering him, and KU remained in its 14-0 hole. Beaty also took umbrage with the officials on the play, after ISU appeared to jump offside, which if called, would have provided the home team with a freebie first down. The fruitless opening minutes for KU even featured a drop by typically reliable freshman running back Pooka Williams, who finished with 58 rushing yards on 17 carries and six receptions for 42 yards. The second quarter didn’t feel quite as disastrous for KU, if only because the offense had two possessions and neither featured a dropped TD. Even so, a promising series concluded inside of the red zone on a completed Bender pass to Robinson. Iowa State cornerback Brian Peavy immediately stripped Robinson of the ball, and Jamahl Johnson recovered it for a Cyclones takeaway. Beaty considered the dropped TD and fumble uncharacteristic of KU, which entered the game with only four lost fumbles and three interceptions. The home team at least closed the first half by getting on the scoreboard. Senior kicker Gabriel Rui saved the Jayhawks the embarrassment of entering the locker room scoreless, sending a 47-yard field goal through the uprights with three seconds left in the second quarter. However, what little boost Rui’s three points provided carried no staying power for the second half. The KU offense went three-and-out the first two times it touched the ball in the third quarter, netting 5 yards on six plays overall. By the time the fourth quarter arrived, and a third Purdy touchdown pass had provided ISU a 27-3 lead, the Jayhawks finally made legitimate threats to score a TD. 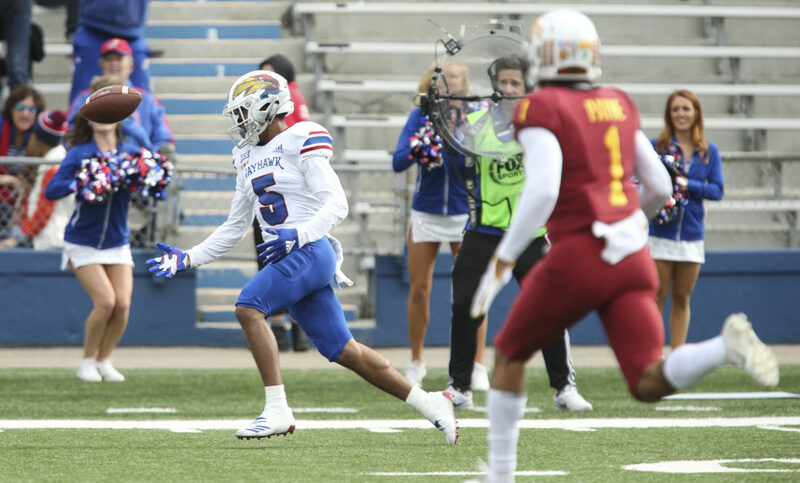 Three separate Robinson receptions for first downs keyed a series that began on KU’s 14-yard line. It ventured into goal-to-go at the ISU 2-yard line before things went haywire. Junior running back Khalil Herbert (91 rushing yards on 21 carries) lined up for a direct snap and then was asked to do his best as a QB, targeting 6-6 sophomore Earl Bostick Jr. in the end zone on a play Herbert said the offense has practiced often of late. Following Herbert’s incompletion, Bender couldn’t connect with tight end James Sosinski on two straight plays. Following a timeout ahead of 4th and goal, ISU stopped a Herbert rush short of the goal line. The Jayhawks’ next possession stalled out with no points to show for it at ISU’s 7-yard line. A trip inside the 10 was met with a Bender incompletion, a successful throw to Steven Sims Jr. (seven receptions 71 yards) and a 6-yard loss on a Herbert carry. 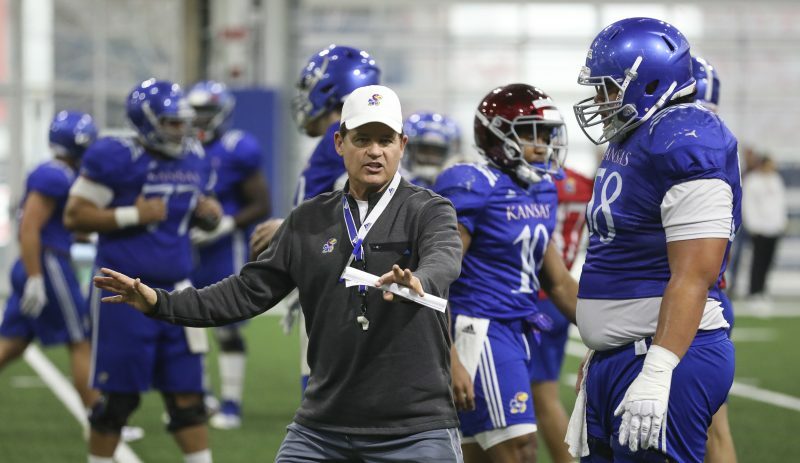 After Beaty fell to 6-39 as KU’s head coach and 2-31 against Big 12 teams, he took the blame for KU’s poor offensive showing versus Iowa State, while crediting the Jayhawks’ defense for doing its part. 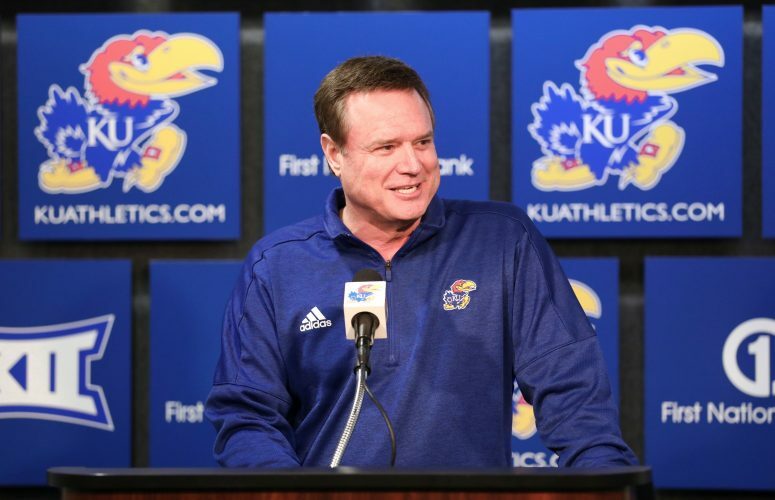 According to Beaty, he didn’t put the Jayhawks in position to execute. Kansas travels next week to take on rival Kansas State, in Manhattan.